The University of California San Diego has added four new majors engaged with real-world concerns to address topics ranging from tackling climate change to sustainable development. Business Psychology, Data Science, Oceanic and Atmospheric Sciences, and Real Estate and Development were established as new majors in response to future demand, workplace trends and alumni feedback. These majors all take advantage of the interdisciplinary nature of UC San Diego, exposing students to a range of faculty and learning experiences across campus. The oceanic and atmospheric sciences major applies physics, chemistry and math to develop an understanding of the ocean and atmosphere. Data science combines cognitive science, computer science and engineering, and mathematics to train students in predictive modeling, data analysis and computational techniques. Business psychology melds core business and management knowledge with understanding how the human mind works and how people work together. 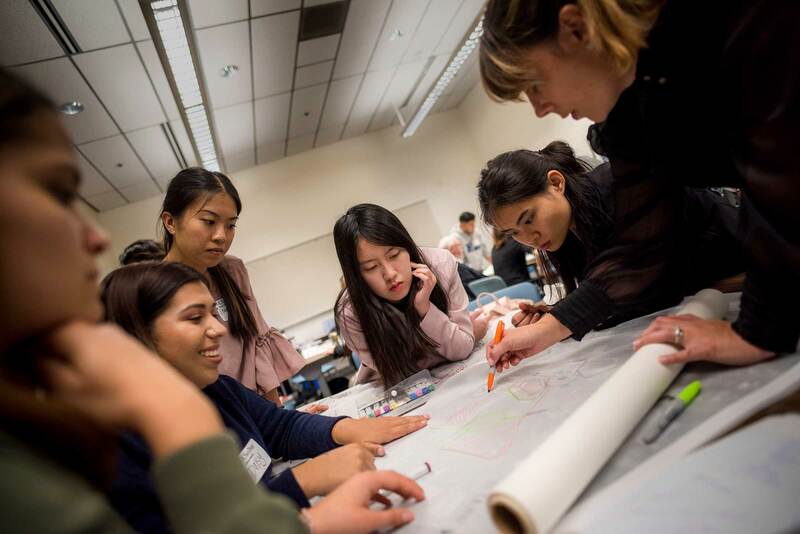 And the real estate and development major connects real estate finance and development with data visualization and analysis, urban planning and design, sustainability, demographic trends, and new technologies. A newly launched major and minor in data science will pull together faculty from throughout campus to prepare students in a variety of disciplines for a careers in which the ability to analyze data is playing an ever more important role—including careers in industry and government, as well as academia. The undergraduate major and minor are two critical parts of UC San Diego’s new Halicioğlu Data Science Institute, which was dedicated in March. The institute was made possible by a $75 million gift from Taner Halicioğlu, ’96, a computer science alumnus and early Facebook employee, who teaches an undergraduate course in the Department of Computer Science and Engineering. The “Data Science in Practice” class taught by cognitive scientist Bradley Voytek drew more than 400 students in Winter 2018. 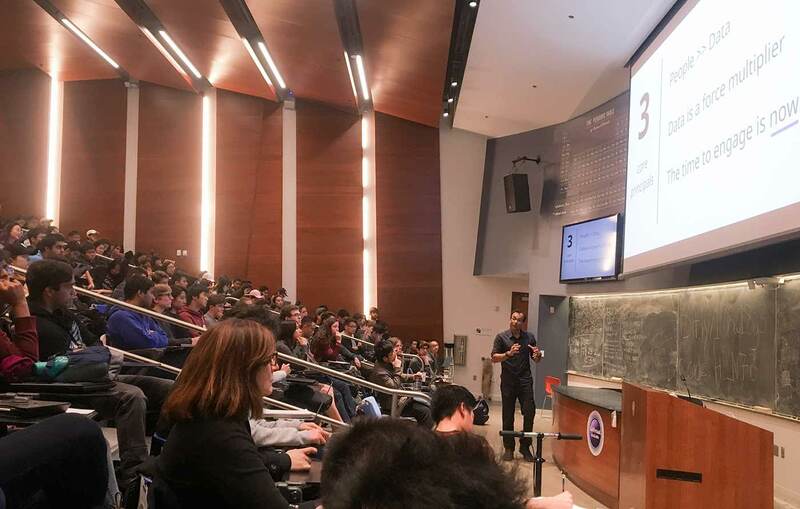 Here, UC San Diego alumnus DJ Patil, the nation’s first Chief Data Scientist, who served in the Obama White House, speaks to the class. Photo courtesy Voytek. The goal of both the minor and major is to train a new generation of students who are equally versed in predictive modeling, data analysis and computational techniques. Students can enter into the major or declare a minor in data sciences from other participating departments. As examples, the minor might include literature majors interested in conducting statistical analyses of digital corpora, psychology majors wishing to conduct large-scale human subject experiments using crowd sourcing, or business and economics students who need to understand computational and statistical methods for analyzing market and customer preference data. 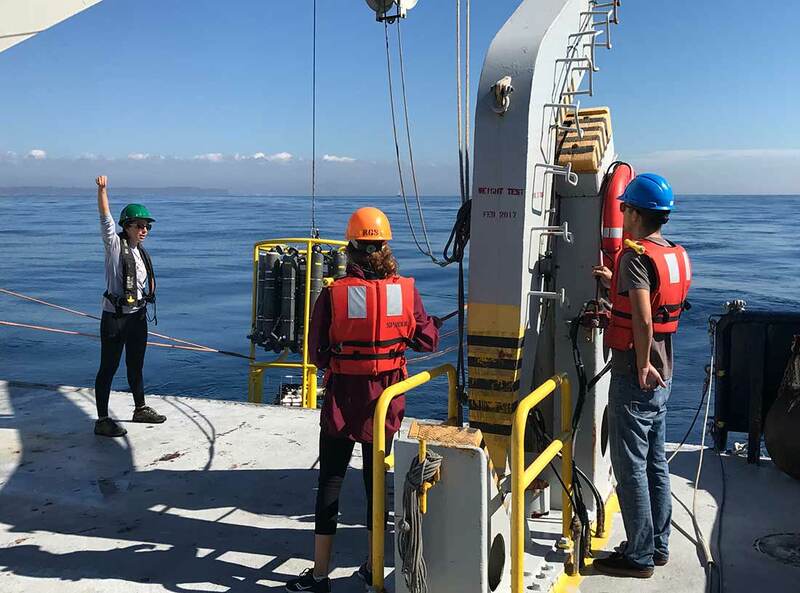 Undergraduate students in the oceanic and atmospheric sciences major learn how to use a CTD instrument aboard the R/V Robert Gordon Sproul, which measures conductivity, temperature and depth. In the class, Experiences in Oceanic and Atmospheric Sciences, students also do experiential learning on Ellen Browning Scripps Memorial Pier, the Scripps Hydraulics Lab, Birch Aquarium and more. Photo by Debbie Meyer. Offered through Scripps Institution of Oceanography, the new oceanic and atmospheric sciences major debuted in Fall 2017 and covers the physics and chemistry of the ocean and atmosphere. Students will study a range of topics of increasing social concern including ocean waves, natural climate variability, human-caused climate change, ocean acidification, atmospheric phenomena and more. According to Rudnick, this hands-on major is ideal for students interested in a natural science, with a focus on studying the ocean and atmosphere. Classes students may take include Ice and the Climate System, Physics of the Atmosphere, Ocean Acidification and Experiences in Oceanic and Atmospheric Sciences. And yes, those experiences include trips to the beach and time at sea, including data collection on Ellen Browning Scripps Memorial Pier and an undergraduate student cruise on R/V Robert Gordon Sproul.